The resignations came less than a day after the Cabinet collectively backed the draft divorce agreement. LONDON – Two British Cabinet ministers, including Brexit Secretary Dominic Raab, resigned Thursday in opposition to the divorce deal struck by Prime Minister Theresa May with the EU – a major blow to her authority and her ability to get the deal through Parliament. But the resignations, less than a day after the Cabinet collectively backed the draft divorce agreement, weakens May and is likely to embolden her rivals within her Conservative Party. A leadership challenge is being openly discussed. 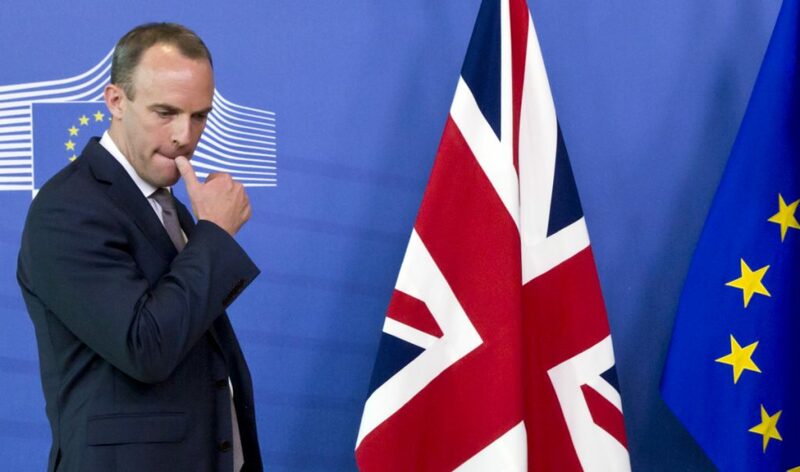 “I cannot in good conscience support the terms proposed for our deal with the EU,” Raab said in a resignation letter to the prime minister. Raab is the second Brexit Secretary that May has lost – David Davis, who like Raab backed Brexit in the U.K.’s June 2016 referendum on its membership of the EU, quit in July of this year. The departures – several junior ministers have also quit – are a further sign that many supporters of Brexit won’t back May in a vote in Parliament on the deal. That’s prompted a big fall in the value of the pound, which was trading 1.5 percent lower at $1.28. Pro-Brexit politicians say the agreement, which calls for close trade ties between the U.K. and the bloc, would leave Britain a vassal state, bound to EU rules that it has no say in making. Before Parliament votes on the deal – the culmination of a year and a half of negotiations between the two sides – EU leaders have to give their backing. On Thursday, EU chief Donald Tusk called for a summit of leaders to take place on Nov. 25 so they can rubber-stamp the draft deal reached by officials earlier this week. May has supporters in her party, and they argued Thursday that the alternatives – leaving the trading bloc without a deal or a second vote on Brexit – were not realistic options. But May’s chances of getting her deal through Parliament appeared to be shrinking. Her Conservative government doesn’t have enough lawmakers of its own to get a majority, and relies on the support of the Democratic Unionist Party from Northern Ireland, which says it will not back the deal. Opposition parties also signaled that they would vote against the agreement if it comes before them – most likely in December. Ian Blackford, who heads the Scottish National Party in Parliament, said the deal was “dead on arrival” and urged May to stop the countdown clock to Britain’s exit, less than five months away. Meanwhile in Brussels, Tusk heaped praise on the EU’s Brexit negotiator, Michel Barnier, who had “achieved the two most important objectives” for the bloc – limiting the damage caused by Britain’s impending departure and maintaining the interests of the other 27 countries that will remain in the EU after Brexit. “As much as I am sad to see you leave, I will do everything to make this farewell the least painful possible for both for you and for us,” said Tusk, who in his role as European Council President chairs the meetings of leaders. The deal also requires the consent of the European Parliament as well as the British one and on Thursday Barnier was set to travel to Strasbourg, France, to win over legislators there. The parliament’s chief Brexit official, Guy Verhofstadt, has already welcomed the draft withdrawal agreement late Wednesday. But over the coming weeks, the British Parliament will be the focal point of the Brexit process. The deal has to be backed by a majority of lawmakers so Britain can leave the EU on March 29, 2019.